The Isle of Arran is reached by ferry from Ardrossan Harbour. 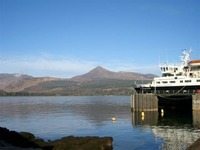 The ferry arrives at the port of Brodick. Corrie is 6 miles due north from Brodick – basically you leave the pier and turn right and keep going up the coast until you hit Corrie, which is the next village. Tigh-na-Blair is at the other end of Corrie, one of the last houses in the village. So you will pass the Sandstone Quay, the Corrie Hotel, the Ferry Rock, the old Port, the church, and the school. Tigh-na-Blair is the third house after the school, easily recognisable by the large deer antlers above the door. You can park either on the opposite side of the road, or reverse up the drive. The entrance to the apartment is at the back of the house. It is advisable to contact CalMac to book your car onto the ferry – there is a link to their website on the Links page. If you are coming without a car, you can get on a bus right at the pier. Take the North End bus, and you can ask the bus driver to drop you off directly in front of the house, as per above directions.